A small but interested group from Transition Centreville/Clifton heard from FABB members and Mike Coyle of the Sully District office speak about getting around Fairfax without a car. Mike discussed the status of the Dulles Rail project, access to the Vienna Metro station, and the I-66 Multimodal Transportation and Environmental Study. Extending Metrorail or creating bus rapid transit are possible options for transit along I-66. Possible station locations include Fairfax Corner and the Stringfellow Rd Park and Ride lot. 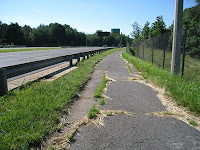 A paved multi use trail along I-66 would also greatly benefit residents. FABB members Bruce Wright, Charlie Dyer, and Fionnuala Quinn discussed bicycling as a transportation option. Bruce gave an overview of FABB, discussed why bicycling is a simple solution to many of our societal problems, and the need for better bicycle education. Charlie gave a summary of what gear you need to be able to use a bicycle for transportation, and Fionnuala gave a brief history of bicycling in the U.S. and the role that citizen participation can play in improving the design of our roads. If you would like FABB to give a presentation to your group, contact chairman@fabb-bikes.org. 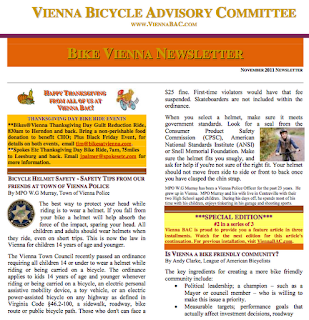 The November edition of the Bike Vienna Newsletter is now available at the Vienna Bicycle Advisory Committee website. Articles include Bicycle Helmet Safety Tips, Is Vienna a Bike Friendly Community, and Bicycles Are Not Just for Kids. A cyclist who was injured on the George Washington Parkway Oct. 9 after a purported hit-and-run incident has teamed up with a lifelong friend to offer a $10,000 reward for the arrest and conviction of the driver. On Sunday morning, Oct. 9, Alexandria resident Phil Hepburn was riding his bicycle with friends on the George Washington Parkway. A driver in a gold Cadillac drove in front of the group, witnesses said, and reportedly braked sharply. Hepburn went under the car and ended up with a broken hip, according to James Turner, an Old Town attorney and hunting buddy of Hepburn's for the past 30 years. Witnesses said the driver then fled the scene. Phone calls and e-mails from Patch to Parkway police about the incident have gone unanswered. Fairfax County Police have deferred calls to Parkway police since the incident occured on the parkway. "They [Parkway police] haven't been following up on this at all," said Turner. Turner and Hepburn are offering the $10,000 reward. 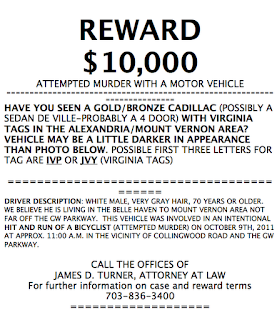 Turner is creating flyers that report a Virginia license plate number of either "IVP" or "JVY" for a gold or bronze Cadillac, possibly a four-door. The flyer describes the driver as an older white male with gray/white hair. Anyone with information should contact Turner at (703) 836-3400. Meanwhile Hepburn is recovering from his injuries, Turner said. "He has to lie in a special bed. He has screws in his hip. He's not permitted to put weight on his leg for three months." 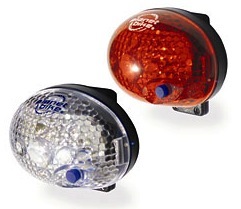 FABB will be installing free bike lights between 2:30 and 5:00 p.m. at LL Bean in Tysons Corner Center. We'll be at the ground level entrance. Bring your bike and we'll in stall the lights. We've reached out to service workers who bike in the Tysons area who need lights. Last week, Metro installed 32 new “U-Rack” bicycle racks at Vienna station, providing parking space for 64 additional bicyclists, nearly doubling bike parking capacity. The new racks are located on the south side of the station, in the direction of the parking garage. 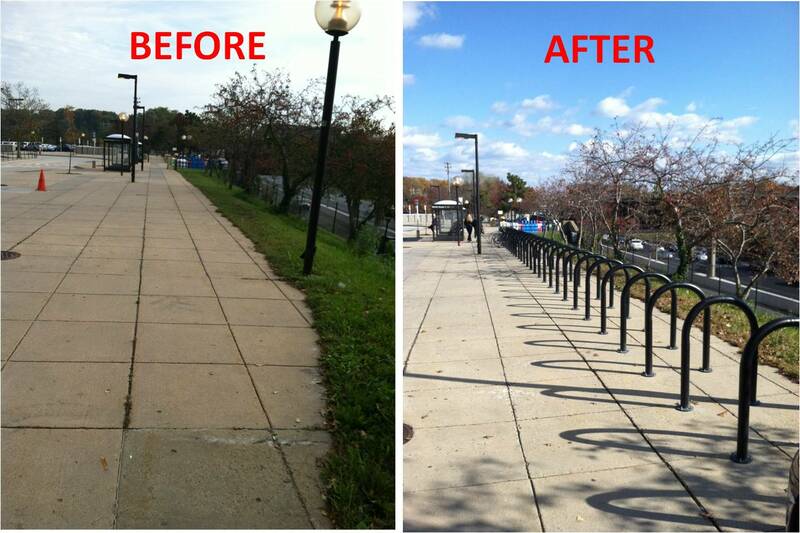 The installation is the latest in Metro’s overall Bicycle and Pedestrian Capital Improvement Program. Vienna’s bike racks were often full, even overflowing, causing cyclists to lock their bikes on railings, trees, and lamp posts. In our last bike parking census, Vienna was the single most capacity-constrained station for bicycle parking. Last spring, we counted 96 total bikes at the station, with 30 bikes tied to objects other than racks. With new space for 64 bicycles, we have almost doubled our bike rack capacity at the station, and will hopefully encourage even more bike-to-rail access here. Several FABB members were present yesterday for the first Graham Road Elementary School Bike Day in Falls Church. This event was organized by a group of local parents including Phillip Troutman and Betsy Scoto-Lavino after they successfully won a $2000 mini-grant from Prevention Connections. They used the grant proceeds to purchase equipment including bike repair stands, tools, pumps, as well as 100 helmets to support an ongoing bike to school program. A bike safety check and adjustment where they learned about the ABC-Spin Check and how to pump air and clean and lube their chain. A helmet check and fitting with many receiving a new or replacement helmet. Children were very engaged and many whole families attended and enjoyed the fun. Lining up for the bike ride. The kids had fun and learned bike safety and handling skills. Currently, 90 percent of all the students walk to the school daily, the highest rating for any school in Fairfax. The school is set to relocate to a new building in the new school year which will increase the rate of busing for students. Graham Road ES parents plan to organize to make a Safe Routes to School application for the school in the next round of grant funding to improve walking and biking access to the new school building. Congratulations to the parents of Graham Road ES on their successful work acquiring funds and providing education and safety equipment to the students of this neighborhood. Posted by FABB member Fionnuala Quinn. Randy and David check detector location and sensitivity. The Soapstone Drive road diet project is nearly finished. Approximately two miles of bike lanes were created when four travel lanes were reduced to two regular travel lanes, bike lanes, and a center turn lane. The bike lanes are striped and a few bike symbols have been painted in the lanes, with several more to be added before the project is complete. There are three traffic signals within or adjacent to the project, at Lawyers Rd, South Lakes Dr, and Sunrise Valley Dr. At most traffic signals in the county the presence of motor vehicles is detected automatically. As many cyclists know, they don't always detect bicycles. BikeLoudoun asked VDOT about this issue last year and wrote the response in their blog post Why Doesn't the Light Turn Green for Bicyclists? According to VDOT Regional Operations Maintenance Manager, Mark D. Hagan, "most of our traffic signals in Northern Virginia use what are known as 'inductive loops,' which is a loop of wire located within the pavement with a small electrical charge that creates an electrical field. The electronic device within the control box cabinet looks for an inductance change within that electrical field and triggers a signal that a car, motorcycle or bike is present." Detectors have been placed in the bike lanes on either side of the traffic signal at Soapstone Dr. and South Lakes Dr. On Saturday VDOT traffic engineer Randy Dittberner and a signal technician from VDOT met David Gibson of Federal Highway Administration to determine the location and sensitivity of the detectors. The detectors are embedded in the pavement and there's no sign of them on the surface. Thy are located about 5 feet behind the bike lane stop bar. When the bicycle passes over the sensor it is detected and a call is issued for a signal change. However, if 10 seconds passes before the signal changes, the call terminates. In order to ensure the light changes, cyclists need to stop on the sensor. Since the sensor isn't visible, a marking is needed to notify cyclists where to stop. The Bicycle Detector Pavement Marking is used for this purpose: "A symbol (see Figure 9C-7) may be placed on the pavement indicating the optimum position for a bicyclist to actuate the signal." In the photo above, the bike symbol will be located where the letters "BK" are painted. To our knowledge, these are the first bike detector markings used in the county. This is progress. Look for them the next time you're riding along Soapstone Dr.
Bob Patten (left) taking notes on local bike conditions. About 30-35 cyclists attended the Fairfax Co. Bicycle Master Plan meeting for the greater Mt. Vernon area last night. Representatives from VDOT, Fairfax Co., and the Board of Supervisors attended as did members of FABB. After cyclists studied and commented on detailed maps of the area, Bob Patten of Toole Design gave an overview of the master planning process. He also described several types of bicycle facilities such as cycletracks, buffered bike lanes, shared lane markings (sharrows), and others. Bob stated that the plan will result in a map showing specific facilities proposed for roads in the county. There will also be policy recommendations to ensure that county policies treat bicycling as an integral part of the transportation system. These not only include bike route facilities but also bike parking requirements, opportunities for bicycle safety education at all levels, improved enforcement, and encouragement of bicycling by using such measures as transportation demand management incentives. Participants then gathered around the maps to mark where they would like to ride and to identify barriers to their travel. The Huntington and Franconia-Springfield Metro stations are major destinations. Several natural and manmade barriers make cycling in this area a challenge. Route 1 is the biggest challenge. Few cyclists choose to ride with 45 mph traffic and there are almost no side paths along the road. Many of the surrounding neighborhood streets don't connect, especially on the south side. Just north of Route 1, Huntley Meadows Park and Fort Belvoir form another barrier. For a 2 mile stretch just north of Mt. Vernon Estate, Little Hunting Creek is a major barrier between several residential neighborhoods, forcing cyclists to use either the Mt. Vernon Trail or Route 1. There are several major attractions in the area including Mt. Vernon Estate, Mason Neck State Park and Natural Wildlife Refuge, Pohick Bay Regional Park, Huntley Meadows Park, and Fort Hunt National Park. U.S. Bike Route 1, the East Coast Greenway, and the Adventure Cycling Atlantic Coast route all pass through this area. The area could be a major cycling destination if there were good bicycle routes connecting major attractions. It's going to take the work of everyone to make this happen. On Saturday we attended the Virginia Bicycling Federation (VBF) Fall Retreat. VBF is a "statewide organization working to change public policy and community attitudes, to improve the safety, convenience, and acceptance of bicycling." The agenda for the retreat included discussion of the following topics: the State Bicycle Policy Plan, review of the updated state bicycle map Bicycling in Virginia, U.S. Bike Routes 1 & 76, legislative priorities for 2012, the 2015 World Road Cycling Championships to be held in Richmond, the Virginia Mountain Bike Trail, and an update on the U.S. Transportation Bill. The State Bicycle Policy Plan was recently released and could have a very positive impact on development of bicycle facilities. Unfortunately there was little time for discussion of the plan. VBF did have copies (front and back) of revisions to the current VA bike map. It appeared that relatively minor changes are being proposed. Several of us recorded comments on the draft map. I think the map could contain much more detail. We spent considerable time discussing routing and signage of U.S. Bike Routes (USBR) 1 & 76. USBR 1 extends along the Mt. Vernon Trail to Mt. Vernon and continues along the southern part of the county to Occoquan. There are few signs and bike conditions are poor in several sections, especially along U.S. Route 1/Richmond Highway. VDOT is responsible for maintaining and signing the routes in Virginia and submitting changes to AASHTO. See a detailed map of the Virginia portion of these routes and an update on the routes from Adventure Cycling. Of note, a new hostel in downtown Richmond is under construction and should be open in 2012. It is located very close to the East Coast Greenway and USBR 1, and not far from USBR 76. Richmond will be the host for the 2015 World Road Cycling Championships, which is expected to draw 500,000 cycling fans to Richmond, visitors who will likely be traveling to other parts of the state. The races are expected to have a $135,000,000 impact on the Richmond area. Chris Scott of Shenandoah Mountain Touring talked about a proposal for linking several mountain bike trails to create the Virginia Mountain Bike Trail. See a video clip of a ride on a portion of the trail. Representatives from American Bikes and the Alliance for Biking and Walking gave an update on the U.S. Transportation Bill. Funding for Transportation Enhancements, which provided the bulk of funding for bike/ped projects in the past, has been cut and future projects will be lumped together with Safe Routes to School, recreational trails, and environmental mitigation projects. 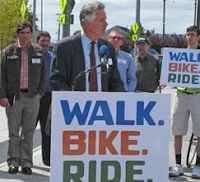 Even worse, states can opt-out of bike and ped funding altogether. The Senate bill should come before the full Senate this week. Stay tuned for possible advocacy alerts. One of the main goals of the retreat was to develop a consensus on a legislative agenda for 2012. Bud Vye of VBF gave a recap of the attempt last year to pass the 3 foot passing bill. After some discussion it was agreed that VBF would try to find a sponsor for the 3 foot passing bill again this year. Bike Charlottesville cyclists are working on a bill to make "dooring" (opening a car door into the path of a bicycle or other vehicle) subject to a ticket and fine. We'll post info on the FABB blog during the session, as will VBF. The day was capped with a 15 mile ride through the beautiful Virginia countryside. Thanks to VBF for organizing and hosting the summit. "It requires cyclists on Federal lands to use a path or trail, instead of roads, if the speed limit is over 30 MPH and a trail exists within 100 yards, regardless of its condition or utility of the path. The provision sets a terrible precedent. Passing it would send the wrong message to transportation agencies that these policies are acceptable. Laws like this have been taken off the books in states over the past 30 years. This takes us in the wrong direction." The League has started an online petition to let cyclists "demonstrate collective anger at this particular language and gives us the flexibility to "deliver" it at the most opportune moment." Please take a minute to sign the petition to fight this ill-conceived proposal. Herndon's Pedestrian and Bicycle Advisory Committee needs volunteers to fill vacancies on the panel. The committee advises the Town Council on safety and transportation issues related to walking and bicycling in Herndon. It works to promote the health and recreational benefits of walking and cycling. It generally meets four times a year. "Talent Bank" applications are available at the clerk’s office. 703-435-6804, town.clerk@herndon-va.gov, www.herndon-va.gov. We recently learned about the Falls Church High School Bike Club. The club is an after school activity organized by Andrew Zlatnik, a teacher at the school. We asked Andrew a few questions about the club. The club was started last year. Currently there are 5 regular members with up to 20 students attending some of the meetings. According to Andrew, "Three of the five regular members ride their bikes at least some of the time. There is a standard bike stand [rack] in front of the school." Several teachers also bike commute some of the time. Andrew would also "like to find ways that we can offer repairs for students who ride or bring bikes to school in the near future." He also works at Phoenix Bikes. "I tried to model the bike club after Phoenix Bikes, including the earn-a-bike program where students can earn one of our donated bikes for themselves, a friend, or a family member after working in the shop for 25 hours and demonstrating basic bicycle repair skills." "I have advertised on Freecycle and contacted several local condominiums or apartments for help in distributing the attached advertisement. We’ve had a slow but steady supply of donated bikes. We do depend on local donations for bicycles to work on. We try to fix the bikes we can, but strip others for usable parts. I recycle any frames or other metal parts that we can’t use." Unfortunately, the club does not have rides since bicycle riding is listed as a "Prohibited Student Activity" by the Fairfax County Public Schools Risk Management office, along with such other activities as "Airplane or Helicopter Rides, All Terrain Vehicle (ATV) Rides, and Auto or Motor Racing". We contacted the Risk Management office and they indicated that if the permission were granted by the Activities and Risk Management offices and parents signed a release and the principal approved, a ride could be held. If you would like to donate a bike to the Falls Church High School Bike Club, contact Andrew at zlatnika@gmail.com. First of all it rolls three key bicycle programs into CMAQ, funds them at a lower level than all the programs combined got last year, and then allows states to spend that money on nothing but roads. Among the casualties are three key bike-ped programs: Transportation Enhancements, Safe Routes to School, and Recreational Trails. Those programs would be consolidated and listed as “eligible uses” under an $833 million subset of the Congestion Mitigation and Air Quality Program (CMAQ). That would represent a sharp drop from the $1.15 billion devoted to those programs in 2010. That year, Transportation Enhancements was funded at $878 million, Safe Routes to School at $183 million, and Recreational Trails at $85 million. (d) BICYCLE SAFETY.—The Secretary of the appropriate Federal land management agency shall prohibit the use of bicycles on each federally owned road that has a speed limit of 30 miles per hour or greater and an adjacent paved path for use by bicycles within 100 yards of the road. This is bad news for bicyclists. Sidepaths adjacent to roads are often in very poor condition. Fairfax hasn't had funds to maintain their paths for many years; imagine if cyclists were required to ride on these trails and were denied their right to ride on the road, roads that are only partially funded by user fees. General taxes cover more than half the cost of most roads. America Bikes, the Alliance for Biking and Walking, and the League of American Bicyclists are all working hard to change the proposed bill. America Bikes created a comparison of the proposed and current bills. The Herndon Middle School Bike Club is accepting bicycle donations on November 7 & 8 from 8 a.m. to 3 p.m. The Bike Club is an after school program at the school. They have teamed up with A-1 Cycling and have facilities for students to repair, repaint, and spruce up donated bicycles for needy children within the local community. See the event flier. See also our previous coverage of the club. I love the idea of the Be Seen, Be Safe event sponsored by Portland's TriMet. 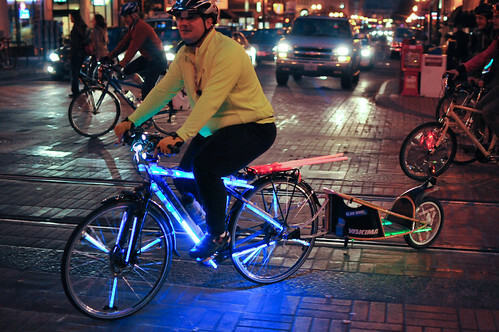 It's a high visibility fashion show, a bike light contest, and a ride to show off the lights and outfits. This weekend the time changes back to standard time so everyone needs to be thinking about being seen and being safe by having the right gear after dark. 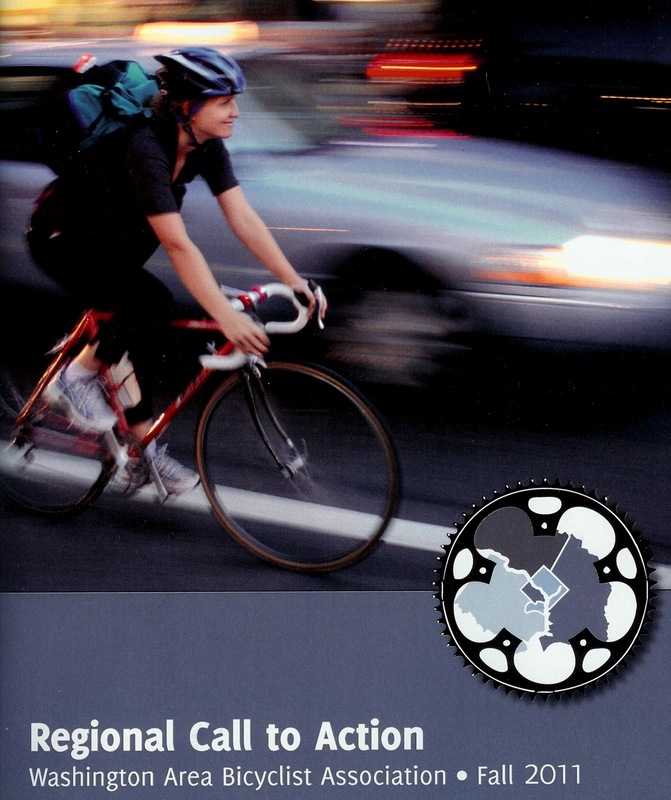 Shane Farthing, Executive Director of the Washington Area Bicyclist Association, officially released the Regional Call to Action report yesterday at the Call to Action Summit. The report was based on the over 1,000 suggestions from 200 cyclists, gathered at local meetings hosted by WABA during the past month. The primary message was that bicycling needs to be a viable, functional transportation choice for the 60% of area residents who are interested in cycling but concerned about the perceived dangers of bicycling. "They would ride if they felt safer on the roadways—if cars were slower and less frequent, and if there were more quiet streets with few cars and paths without any cars at all." In order to create conditions for encouraging those interested but concerned cyclists, we all need to work toward this goal; advocates and bike advisory groups, local bike shops, recreational and competitive organizations, and WABA leading the way as the regional advocacy organization. WABA has paid staff who can help make this happen. FABB serves as WABA's volunteer advocates on the ground in Fairfax and we need everyone's help. The best way to help in Fairfax is to get involved in planning for the future of bicycling in the county. The bicycle master plan is currently being developed by the county. Meetings are being held to gather cyclist input. This is the detailed information needed to develop a list of projects and activities that will help make bicycling a functional transportation choice in Fairfax. The next meeting is for the Mt. Vernon area on Thursday Nov. 176. Other highlights from the Summit included a very good presentation by local attorney Bruce Deming, "Crashed! Your Legal Rights In A Bicycle Accident." Bruce covered what cyclists should do if they're involved in a crash. He stressed the importance of having a witness to the crash. Without that, it's going to be your word vs. that of the motorist. Find out if a ticket was issued to the motorist and if so, follow the case. Be aware that anything you say about the crash and your actions can be used in court. Since Virginia, Maryland, and DC are all contributory negligence states, if you admit to any negligence, however minor, it can result in the case being dismissed if it is tried in court. If you need an attorney, look for someone with experience working with bicyclists. WABA maintains a list of bicycle attorneys. Gina Arlotto, WABA Safe Routes to School Network Coordinator, discussed Tools for Planning Healthy Communities. She discussed the Safe Routes to School program and Health Impact Assessments (HIA) as possible tools. "HIA is used to evaluate objectively the potential health effects of a project or policy before it is built or implemented." Gina has been a tremendous asset in Fairfax, helping FABB and others as we work with Fairfax schools to encourage more kids to walk and bike to school. See the Fairfax SRTS Facebook page for more info. One statement that summed up her discussion is that people should not only live in a place but they should be able to thrive. Bicycling allows people to get around in a healthy, low cost way. A good resource on the topic is Making Healthy Places: "There is a pressing need to create healthy places and to reduce the health threats inherent in places already built." Former WABA Executive Director Eric Gilliland gave an overview of the first year of Capital Bikeshare. He is now General Manager, of Capital Bikeshare (CaBi). CaBi now has 19,000 annual and monthly members. Over 1,000,000 trips were taken in the first year. Most of those trips were less than 20 minutes in duration (there is no additional charge for trips under 30 minutes). We asked Eric about the possibility of having CaBi in a suburban location like Reston. He said it depends on the situation such as the density of population, type of destinations, proximity to transit, etc. Charlie Denney, Senior Associate of Alta Planning & Design, said that 20 stations with 200 bikes is a rough guess at the critical mass needed for a small system. Professor Ralph Buehler and Masters Candidate Darren Buck, of Virginia Tech Alexandria Center presented interesting research on CaBi use and bicycling in the DC Metro area in general. Their research will be presented at the Transportation Research Board meeting in January. An interesting but not surprising finding of Darren's was that proximity to bike lanes has a significant impact on use of CaBi in an area. The results of an extensive survey of CaBi users will be available in December. Professor Buehler gave preliminary results of his work on bike commuting in the Metro area. He noted that in DC, bike commuting comprises a much higher promotion of bike trips that in other places. He also showed that where there are more bike trips per person, the rate of bike fatalities is lower than where there are fewer bike trips per person, with Fairfax Co. having the highest fatality rate in the region. WMATA staff Nat Bottigheimer (Assistant General Manager), Patrick Schmitt (Parking Manager), Kristin Haldeman (Manager of Access Planning & Policy Analysis) discussed advances WMATA is making in providing better access to, and parking at WMATA facilities. WMATA expects to need 30,000-40,000 new parking spaces in the future at a cost of $20,000-25,000 per structured parking space. If some of those patrons rode bikes or walked, significant savings could be realized. Forty five percent of those who park live within 3 miles. Currently 33% of their patrons walk to the station, 29% park, and 1% bike. One major change at WMATA is that bike parking, both lockers and racks, is now managed by the Parking office. As we noted earlier, a Bike & Ride facility is under construction at College Park Silver Spring and one is planned at Franconia-Springfield. The final panel consisted of local bike industry reps discussing the importance of bike advocacy to their business. They know that if more of those 60% interested but concerned cyclists were riding, they would sell more bikes and we'd live in a better place. It was mentioned that we need to get other businesses that support bicycling and healthy communities to get involved. When they are in the room, politicians listen. Without their help, it will be a much harder struggle making the DC Metro area a more bike-friendly place. One added benefit of attending the conference was the spectacular view of Georgetown and DC from atop the Waterview Conference Center, including being able to watch the interactions of trail users and other traffic at the Custis Trail/Lynn St intersection. Update: WABA has posted their summary of the Call to Action Summit and the final version of the Call to Action report. Tonight three of us from FABB gave out 18 sets of bike lights to cyclists along the W&OD Trail and at nearby retail areas. We started in Falls Church at the intersection of the W&OD Trail and Route 123. There are usually several bikes parked at a car wash nearby so we stopped there and installed some lights on those bikes. We then rode from there toward Vienna. As we saw cyclists without lights we asked if they wanted a free set. Most were surprised and grateful. Once we got to Vienna we cruised along Route 123 looking for bikes parked near restaurants and other shops. The bike lights were purchased through a grant from the Transurban-Fluor Community Grant Program. We have a few more sets of lights that we'll be giving out in the next couple of weeks. Daylight savings time ends on Sunday, Feb. 6 so be sure you have your lights ready. Sunset on Monday, Feb. 6 is 5:02 p.m. If you ever need to check sunrise and sunset times try the Sun and Moon Data website. Fairfax County recently held meetings in the Clifton and Reston-Herndon areas to hear from cyclists about what bicycle improvements are needed. As part of the County Bicycle Master Plan process, meetings are being held around the county. Six more subarea meetings are planned over the coming months. The next meeting will cover the Mt. Vernon area on Thursday, Nov. 17, from 5:30 – 8:00 p.m. at the South County Government Center. See the County Bike Plan website for details, including a map of the 8 geographic areas. The meetings are a good opportunity for you to point out barriers to your travel by bike, suggest improving bicycle education in schools, and discuss your most important destinations, dangerous intersections, and where bike parking is needed. Comments from the meetings will be used to develop the final plan, which will set the stage for bicycling in the county for the next 20-30 years. The next meeting of the Master Plan Advisory Committee is on November 16. FABB has members on the committee and if you have ideas you would like us to pass on, please let us know. On October 5, Fairfax County Public Schools celebrated International Walk and Bike to School Day for the first time. In the past, only a few individual schools were involved. FABB, Washington Area Bicyclist Association, Trails for Youth, and others advocated that the county celebrate the event throughout the school system. We worked with FCPS staff to develop promotional materials to help get the word out about the event. Twenty-seven schools participated this year, holding various activities for walkers and bikers. See the map of schools that participated. For news on Safe Routes to School activities in Fairfax visit the Safe Routes to School - Fairfax Facebook page. FABB provided extensive comments on the plan in September 2010. Most of our comments were included in the final report. Highlights from the plan include narrowing travel lanes to 10 feet to create bike lanes or wider outside lanes, extending VDOT projects to link to nearby bike facilities, and doing a better job of inventorying bike facilities and counting bicyclists so that future progress can be tracked. The plan contains lots of good information and it is worth spending some time reading it. See the FABB blog entry for more information. WABA is holding its Regional Call to Action Summit on Thursday, Nov. 3. WABA recently met with Fairfax cyclists to gather information for the Regional Call to Action report. Suggestions from the meeting along with comments from FABB, will be published during the Call to Action Summit. This information will also be used by FABB as additional input to the County Bicycle Master Plan. Visit the WABA summit page for details about the summit and to register. LAB recently recognized George Mason University as a bronze level Bicycle Friendly University. GMU has made great progress in recent years. They hold Bike to Mason Day each year. This year they are also holding regular Bike to Campus days coordinated by the GMU bicycle program. They also hold occasional bike commuter and safety classes on campus. Staff can apply for the bicycle benefit and receive $20/month toward purchase of bike supplies and maintenance. Patriot Circle and George Mason Blvd now have bike lanes or shared lane markings. Covered bike parking with inverted U racks is available in many locations. In a separate action, Reston failed to receive recognition as a Bicycle Friendly Community, but they were given an honorable mention, which is encouraging. On the plus side, Reston has a few miles of bike lanes on Lawyers Road that VDOT installed as part of a road diet. VDOT is also adding bike lanes on Soapstone Drive as part of another road diet. Reston holds a very successful Bike to Work Day that FABB members help organize each year. The Reston Bike Club holds numerous group rides throughout the year. However, Reston needs to do much more to become truly bike friendly. Along with the Honorable Mention designation comes a list of actions the community can take to improve their bike friendly ranking. These actions include improving bike parking, adding bike lanes and paved shoulders to major roads, provide better bicycling education and encouragement, and starting a bicycle count program. The Reston Pedestrian & Bicycling Advisory Committee plans to use this feedback to plan future projects. FABB will be giving away bike lights again this fall. The main goal is to enhance the safety of service workers who depend on bicycles for transportation and who often travel at night without lights. If you know a good place to hold a giveaway and want to help organize it or assist in installing the lights, please contact us. This is a very worthwhile service to the community. On October 25 FABB testified before the Commonwealth Transportation Board on future transportation projects in Virginia. We discussed the need for developing transportation projects that also contribute to our quality of life. More county residents want to walk and bike for short trips, and often VDOT projects have a negative impact on those modes. We noted that poorly maintained roads and trails have a significant impact on cyclists’ safety. We asked that adequate funding be provided for bike and ped projects in preparation for development associated with the new Silver Line stations in Tysons. See our complete testimony on the Six-Year Improvement Program. FABB FACTS - In the Reston-Herndon area 45% of all non-commute trips are less than 3 miles and can easily be taken by bicycle. Of commuting trips, 18% are less than 3 miles. November 3, Thursday - WABA’s Regional Call to Action Summit from 8:30 a.m. to 4:30 p.m. at the Waterview Conference Center, 1919 N Lynn St, Arlington, VA 22209. November 16, Wednesday - Fairfax County Bicycle Plan Advisory Committee Meeting, 1:00-3:30 p.m., Fairfax County DOT office, 4050 Legato Rd, Suite 400 (4th floor). November 16, Wednesday - FABB monthly meeting from 7:30-9:00 p.m. at Patrick Henry Library, 101 Maple Avenue East, Vienna, VA near the W&OD Trail. All are welcome. For more information contact Bruce Wright at chairman@fabb-bikes.org. November 17, Thursday - Fairfax County Bicycle Master Plan area meeting - Mt. Vernon, Rose Hill, Ft. Belvoir, Mason Neck, Huntington areas. The meeting is from 5:30-8:00 p.m., South County Government Center, 8350 Richmond Hwy, Alexandria, VA, Conference Room 221 A-B, 2nd Floor. Residents of these areas should attend and let the planners know what is needed to make the areas more bike friendly. Fairfax Advocates for Better Bicycling is a sponsored project of the Washington Area Bicyclist Association, aiming to make bicycling an integral part of Fairfax County's transportation network. Visit us on the web at www.fabb-bikes.org, on Facebook and on Twitter. FABB News provides periodic updates on Fairfax County bicycling issues, along with occasional updates and action alerts on breaking news. We encourage all FABB supporters to join WABA at www.waba.org. Donations to FABB are tax deductible. If you would like to support our advocacy work in Fairfax, you can donate by sending a check made out to WABA/FABB to WABA, 2599 Ontario Rd. NW, Washington, DC 20009 or donate online. Virginia has secured a $180 million grant from the Defense Department's Office of Economic Adjustment to widen Route 1 in the area of Fort Belvoir to six lanes between Telegraph Road and Mount Vernon Highway. The 3.5-mile widening could begin as early as 2013 and take up to three years to complete. "Widening Route 1 is critical to ensuring a viable transportation network in the Fort Belvoir area," said Governor McDonnell. "Our nation's wounded warriors, veterans and their families deserve to have reliable and safe access to Fort Belvoir's new Community Hospital. Moreover, every day, commuters are stuck in long traffic queues on Route 1 that has only worsened with the additional traffic generated by BRAC changes bringing more defense personnel to Fort Belvoir. This widening will improve the quality of life for thousands of commuters and visitors." The Virginia Department of Transportation (VDOT) and Fairfax County submitted joint grant applications earlier this year requesting funding to accommodate the increased traffic generated by the Base Realignment and Closure (BRAC) and the new Fort Belvoir Community Hospital which will generate 574,000 trips annually. VDOT estimates the widening will cost $180 million, including $53 million to acquire right of way, $20 million to relocate utilities, $10 million for environmental mitigation and $97 million for construction. The portion of Route 1 serving Fort Belvoir is only two lanes in each direction, carries 56,000 vehicles a day and has one of the highest highway crash rates in northern Virginia. Between 2006 and 2008 there were 294 crashes on the 3.4-mile section between Telegraph Road and Mount Vernon Memorial Highway, including 13 injuries and one fatality. In 2011 two more fatalities occurred. In addition, Route 1 in this area lacks pedestrian and bicycle access and crosswalks at intersections. I'm writing to comment on the proposed design for the above-referenced highway widening project, as described in your agency's brochure for the October 19, 2011 public meeting. Although the official public comment period ended yesterday (10/31/11), I only became aware of this project this afternoon after seeing Governor McDonnell's news release about the $180 million Department of Defense funding award. Thus, I hope you will include this comment as part of the official record of your October 19, 2011 public meeting. This 3.4-mile segment of US Route 1--between Mount Vernon Memorial Highway and Telegraph Road--is a vital link for local, regional, and long-distance bicycle travel and could serve as a key link in the East Coast Greenway, the Potomac Heritage National Scenic Trail, and/or U.S. Bicycle Route One. Because of its importance for long-distance bicycling, it's critical that this project include exemplary accommodations for all types of bicyclists, including skilled, faster, and longer-distance bicyclists. The "Current Proposed 148-foot Typical Section" illustrated in the meeting brochure seems amply wide to accommodate all needed pedestrian and bicycle facilities as well as a dedicated transitway in the median, in addition to six roadway travel lanes. However, in view of the high (50+ MPH) motor vehicle speeds on this roadway, the 14-foot wide "Oversized Outside Lane[s] to Accommodate Bicycles" should be designed and striped as dedicated bike lanes and continued on the *left* side of *all* right-turning lanes at the approaches to *all* intersections. To best execute these bike lanes, the middle and inside travel lanes could be striped 6 to 12 inches narrower than illustrated in the meeting brochure, to provide an 11-foot wide outside travel lane plus a 4-foot wide bike lane (to the left of the concrete gutter pans) in lieu of the 14-foot wide "oversized outside lane" illustrated in the meeting brochure. Thank you for considering this comment. Please do not hesitate to contact me if you need more information, and please include my email address and/or other contact information in future project announcements. While the widening project will provide bike facilities, it will make the road more dangerous for pedestrians and some bicyclists. The wide road and speeding traffic, in a busy commercial area, are a deadly mix. The speed limit should be lowered and much better bicycle and pedestrian accommodations are needed in this corridor.